Many teachers use Norman Webb’s framework in developing assignments, but it can also be shared with students to help them develop literacy skills. Educators spend a great deal of time analyzing diagnostic, formative, and summative performance data to individualize instruction for their students. In my current role as a staff developer, I’m often asked about how to do this while meeting curriculum expectations and benchmarks and supporting critical thinking skills. I find myself discussing the concept of critical thinking in many contexts, including curriculum planning, lesson ideas, and assessment. I like to use Norman Webb’s Depth of Knowledge wheel to unpack what critical thinking might look like in a variety of contexts to support literacy skills, working with teachers to identify the link between the Depth of Knowledge levels and the Common Core State Standards. I often use Gerald Aungst’s “Using Webb’s Depth of Knowledge to Increase Rigor” in my work with teachers, because the article explains the four levels outlined in Webb’s framework for cognitive rigor in the classroom. Aungst makes clear recommendations for teachers, including: reflecting on tasks, sorting the tasks we ask students to do, working collaboratively to review student groupings, analyzing groupings, and reworking Level 1 and 2 tasks to Level 3 or 4. One important point he makes is that “DoK levels are not sequential.” In other words, students don’t need to fully master a Level 1 in order to move on to a Level 2. While Aungst provides actionable ideas for teachers, I would like to propose a road map that includes students in the process. 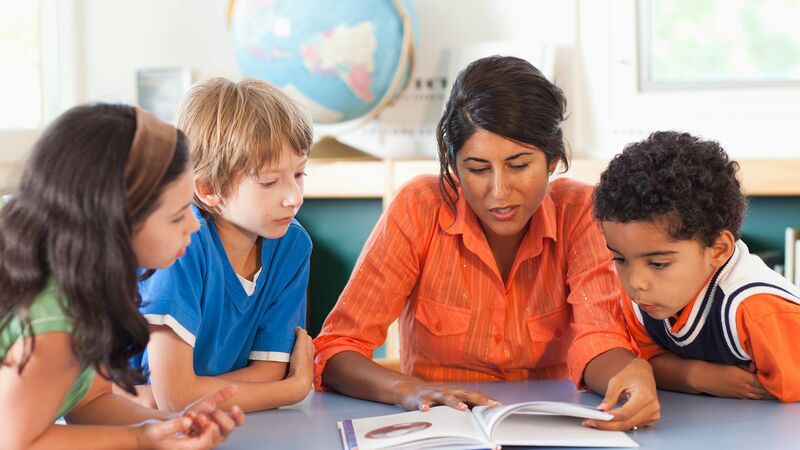 When it comes to enhancing literacy practices in the classroom, there is a great deal of research that supports explicit instruction, as well as the role of student engagement and achievement. The authors of a recent guide to improving adolescent literacy have five recommendations based on this research: Teachers should provide vocabulary instruction, comprehension strategy instruction, opportunities to discuss surrounding texts, work that enhances student motivation and engagement, and individualized intervention resources. Webb’s Depth of Knowledge (DoK) can be a useful tool in acting on all of these recommendations. Webb’s DoK provides students with language tools to access text and classroom discourse. I’ve found that helping students develop their understanding of the language within the DoK has been beneficial in supporting literacy and can also support students as they prepare for Common Core–aligned assessments. In fact, helping students review and code sample questions can help them figure out which strategies they might need to apply in order to answer the questions. 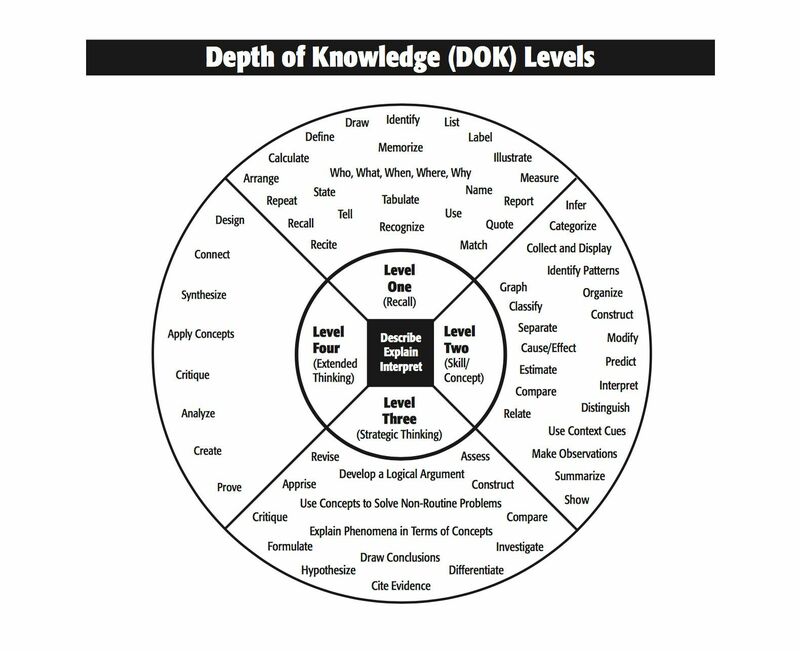 In my experience, students like using the DoK wheel to figure out how it aligns with their assignments. They also enjoy using it to develop their own questions to ask their peers. These kinds of activities ask students to critically think about what kinds of questions they will ask, and in doing so, engage in rich metacognitive learning experiences. This can be particularly empowering as students are increasingly faced with the rigors of high stakes testing. Many assessments require students to critically analyze texts, make inferences, prove their responses using textual evidence, develop a claim or analyze an author’s claim, and make comparisons. Explicitly teach students about the different cognitive levels and ensure that they understand what each of the terms means. Then, have them analyze question prompts for DoK level and assess what they are being asked to do—e.g., are they asked to categorize, infer, or predict? Work with students on unpacking strategies that help them engage in that cognitive activity. Consider creating process charts with them to identify the skills needed. For example, what kinds of skills and tools might we need to analyze a character’s motivation in a story? Give students the opportunity to develop their own questions aligned to the DoK levels that can be used in collaborative settings through group work, in Socratic seminars, or through a carousel, for example. Offer students the opportunity to reflect on their strengths—are they really strong in certain areas, but want to further develop in others? Have students code their assignments and questions. This is empowering and offers students a chance to reflect on what they are being asked to do. These suggestions can be implemented with elementary and secondary students. 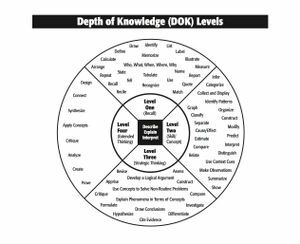 I’ve seen teachers create and display large posters of the DoK wheel and use it throughout their lessons. This direct linking of the academic language embeds the framework so that it becomes a fluid part of classroom discussions. I’ve seen elementary students adeptly use the wheel as a way of explaining their own learning. We can view Webb’s framework as one of many tools that can be used to help students develop their own understanding of what rigor means, and in so doing, give them a vocabulary to articulate their own goals and learning experiences.